I have wanted to cook this dish for a very long time. The recipes for cannelloni usually call for Bechamél sauce, however, the dish becomes much lighter if you use tomato sauce instead - and is surely no worse! 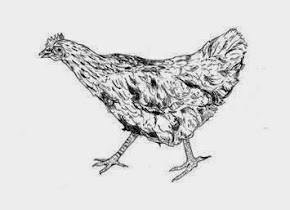 And of course, the cooking procedure is much easier than many suspect. 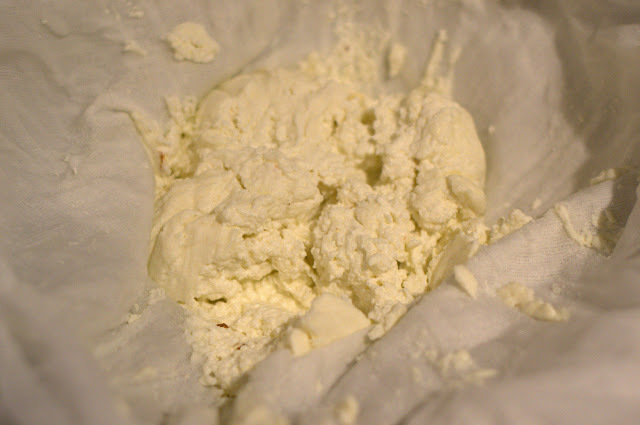 In making ricotta cheese there is no need for rennet, the only things you need is lemon acid and then salt relative to the taste of each - and it only takes around half an hour to make! That brings us to the cannelloni which begins with the ricotta cheese. The cheese is particularly fresh and, as mentioned before, takes surprisingly little time to conjure into existence. Pour four liters of full fat milk into a pot. Teaspoon of lemon acid along with a teaspoon of salt are added. Stir well. Heat the milk up to 90 degrees. Remove from the heat and allow it to rest for five minutes or until the cheese has separated from the buttermilk. 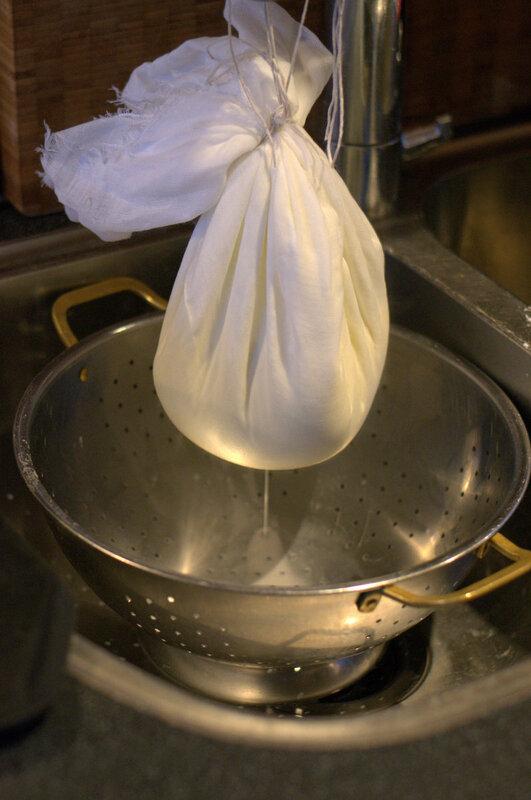 Pour the milk through a cheesecloth and then allow the cheese to hang in the cloth for 30 minutes so it can dry out a little bit. You can allow the cheese to hang for a bit longer if you wanted it more dry. For the filling you need 250 gr of spinach - which is placed into a bowl. 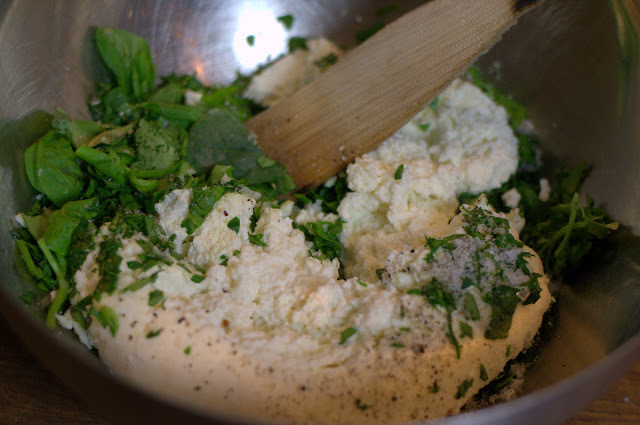 Add the cheese to the spinach as well as a handful of parsley, two tablespoons of basil, and enough og salt and pepper. Mix well together. Next up is the tomato sauce. 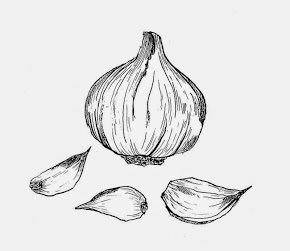 Begin by chopping finely one large red onion and four bulbous cloves of garlic. Fry together in a dash of extra virgin olive oil until soft. To this is added two cans of canned tomatoes, three tablespoons of ketchup, two tablespoons of balsamic vinegar, and seasoning. Reduce to until 1/3 of its original amount - which should take around 20 minutes. Pencil an ovenproof dish with oil and pour into it half of the tomato sauce. Stuff the cannelloni pasta tubes with the filling and then distribute them in orderly rows on top of the sauce. Pour the rest of the tomato sauce over the whole shebang. Finally, scatter a bit of grated cheese over the tomato sauce. 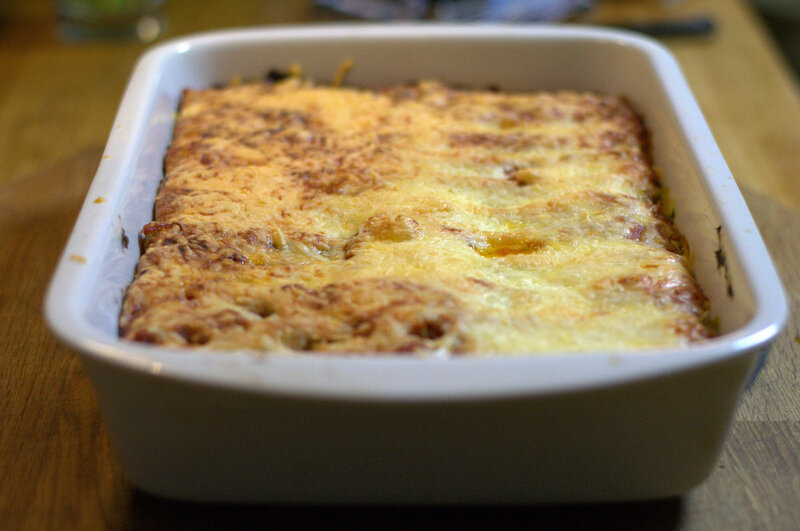 Bake in a preheated oven, at 180 degrees, for 30 minutes or until the cheese has become golden brown and utterly irresistible. Served with a simple salad, a steaming loaf of bread. Grating a little parmesan over the lot doesn't harm either! With the food we had a nip of Italian wine which I have never tasted before, Marchese Chianto Classico Riserva from 2008. What a delightful bottle of wine this is. I might have received it as a present from someone (in one of the many hazy dinner parties held in this household) - and I formally take the opportunity to extend my gratitude to that generous and tasteful person (whoever you are, you mysterious do-gooder!) It is rich in berries and is deep on the whole - on the dry side with decent tannins. When you look this wine up on the internet it generally scores over 90 points. The food was particularly delicious. And I encourage everyone to try it out and especially making their own cheese - you will be happily surprised!